There are also some noticeable short-comings. There’s no obvious “mark all as read” button (you need to select “unread only” using the filter icon). Frustratingly the app doesn’t remember filter setting – I’m a bit OCD obessive and filter feeds by Label and then Feeds (so as to mirror my Google settings), but everytime you relaunch, the UI resets to default. Finally, for an app that is so detailed, the inability to drill and pull the linked web page into cache if the RSS feed itself is truncated seems a bit of an omission? To be fair only Byline really seems to have mastered the seamless caching of webpages behind RSS feeds – it takes a little longer to sync as a result, but at 30 000 ft there generally isn’t a lot of wi-fi around so it’s my #1 choice for offline reading. The biggest issue for me is that the app doesn’t remember filter settings – hopefully the next update will fix this? 1. ‘Mark all as read’ button exists. It will appear when long-pressing the cell in article list. BTW, this feature is applicable on any folder. 2. Saving filter change will be added to our next to-do list(^-^). 3. First sync may take some times but daily sync will not. 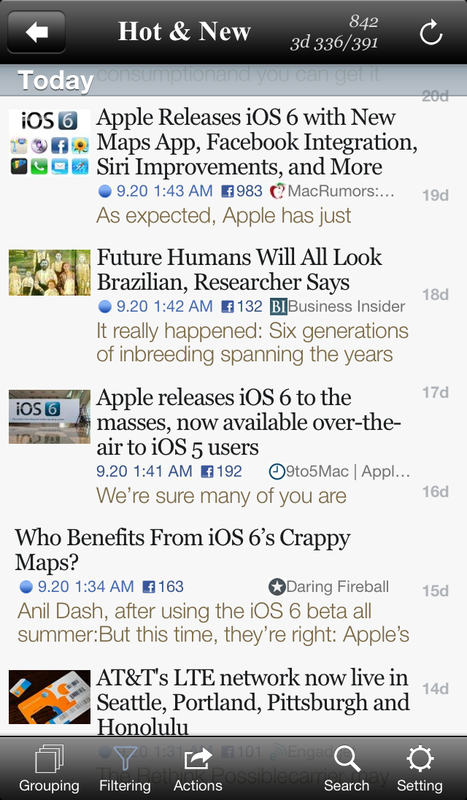 Daily sync updates only new and very recent articles. The general guideline will be helpful. 4. Caching of webpages is omitted as you pointed. We think, webpage caching is out of RssBook’s valid coverage. Instead, we will add support for offline page reading service in the near future.